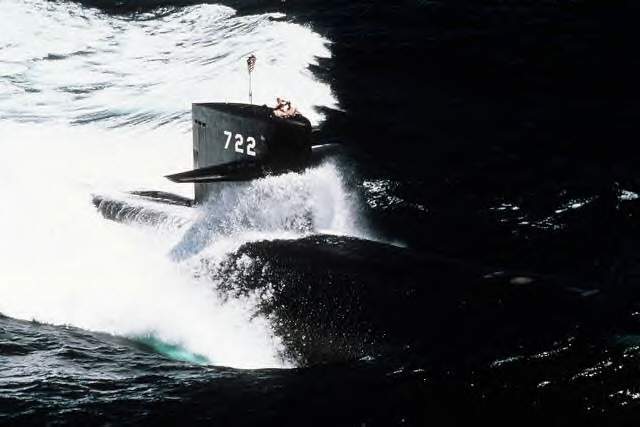 Los Angeles Class Attack Submarine: Laid down, 6 July 1983, at Newport News Shipbuilding & Dry Dock Co., Newport News, VA.; Launched, 20 July 1985; Commissioned, USS Key West (SSN-722), 12 September 1987. 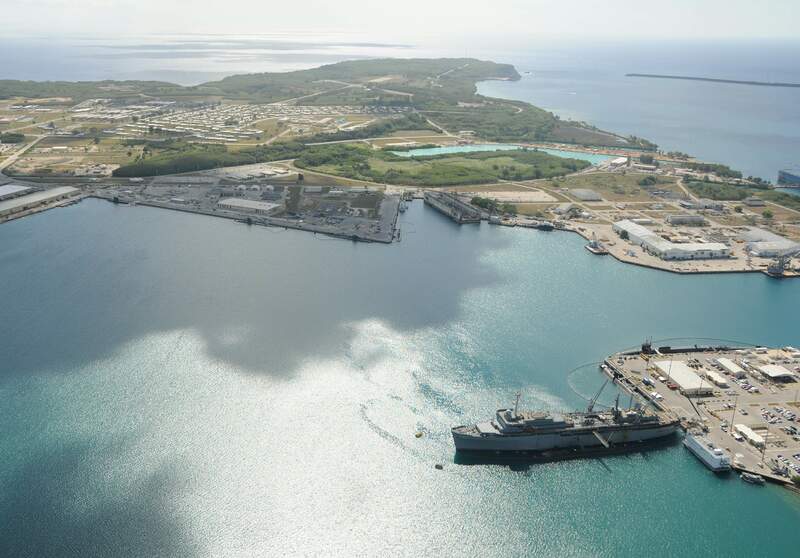 Key West is assigned to the US Pacific Fleet and is homeported at Pearl Harbor, HI. 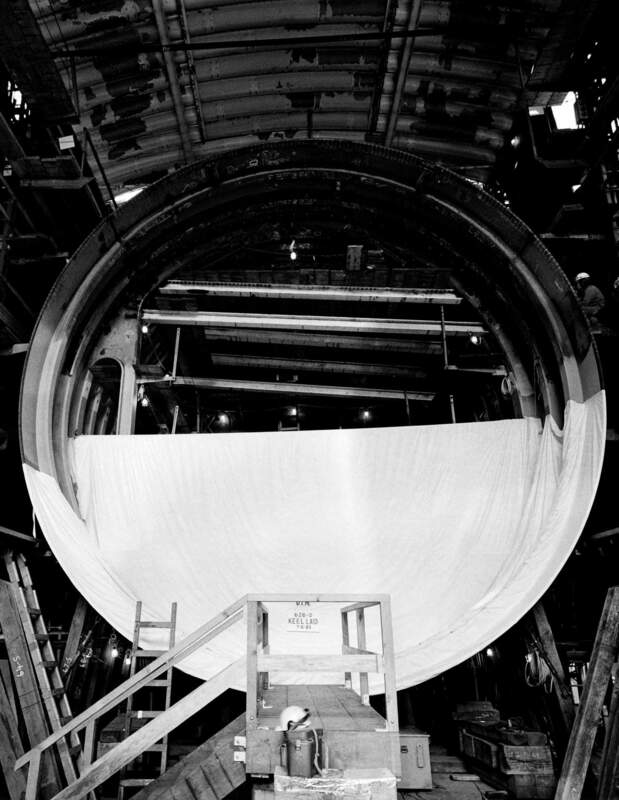 283k A view of the keel laying for the Los Angeles class attack submarine Key West (SSN-722) at the Newport News Shipbuilding and Dry Dock Company, 6 July 1983. USN photo # DN-SN-83-10502, by Chrix Oxley from the Department of Defense Still Media Collection, courtesy of dodmedia.osd.mil. 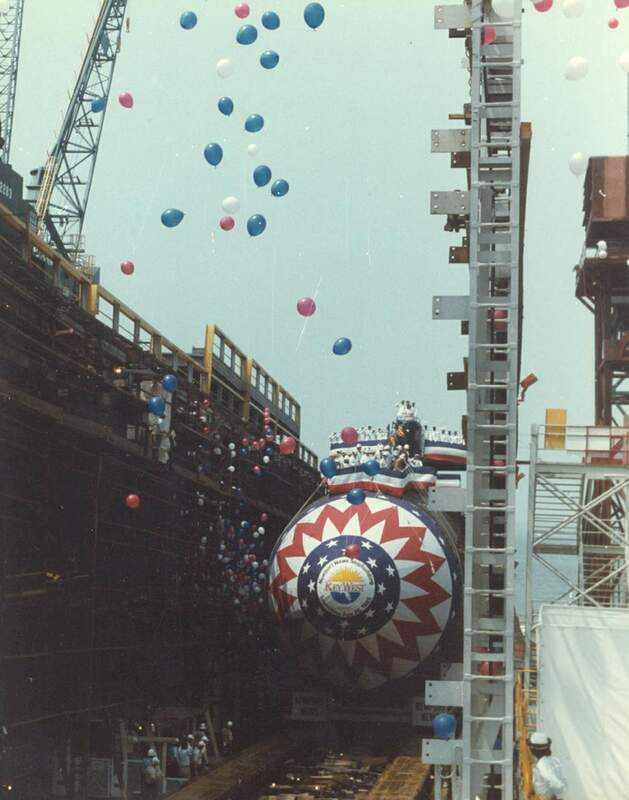 172k Key West (SSN-722) keel laying cachet, 6 July 1983. Photo courtesy of Scott Koen & ussnewyork.com. 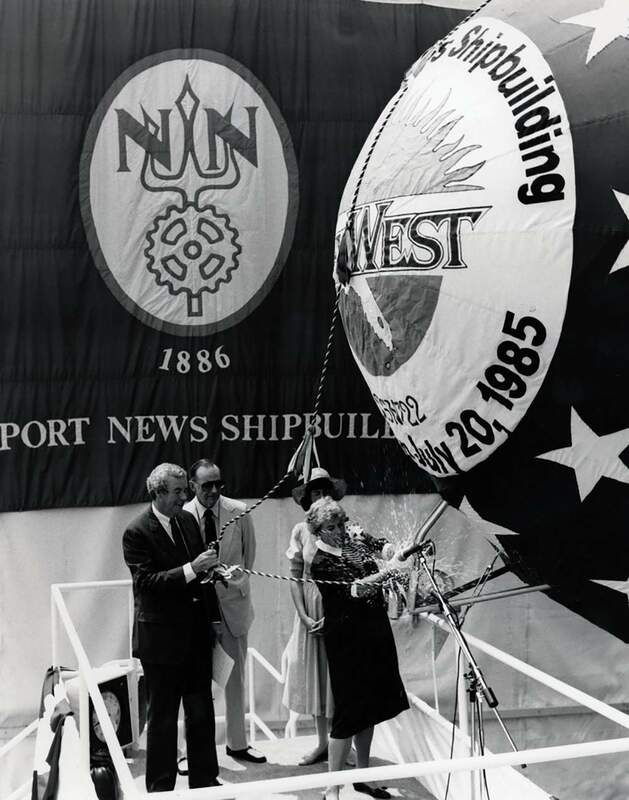 128k Mrs. Robert H. Conn, wife of Assistant Secretary of the Navy Robert H. Conn, christens the nuclear-powered attack submarine Key West (SSN-722). USN photo # DN-SN-86-12572 from the Department of Defense Still Media Collection, courtesy of dodmedia.osd.mil. via Robert Hurst. 113k The nuclear-powered attack submarine Key West (SSN-722) slides down the ways after being launched at Newport News Shipbuilding & Dry Dock Co., Newport News, VA. on 20 July 1985. Photo courtesy of Scott Koen & ussnewyork.com. 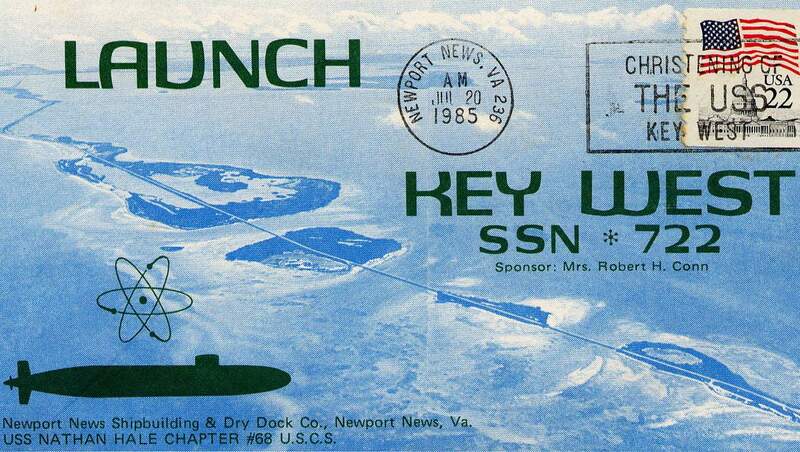 149k Key West (SSN-722) launch cachet, 20 July 1985. Photo courtesy of Scott Koen & ussnewyork.com. 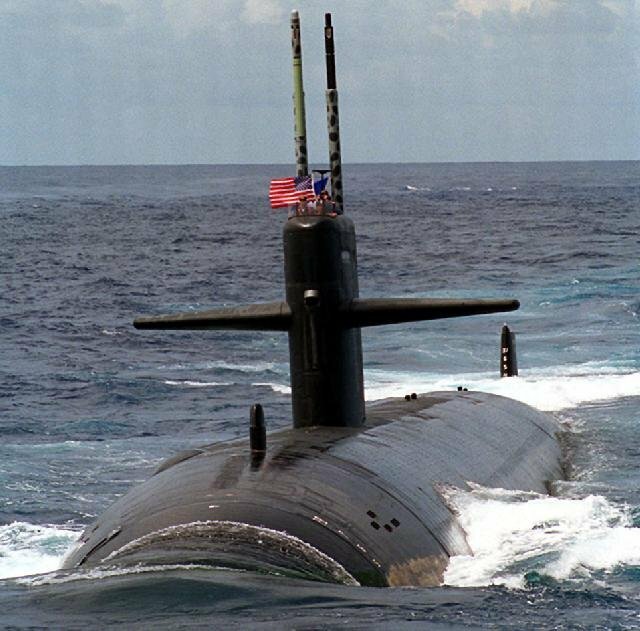 320k The Los Angeles class attack submarine Key West (SSN-722), undergoing sea trials off the coast of Virginia, 1987. USN photo # DN-ST-89-01397, by Chrix Oxley from the Department of Defense Still Media Collection, courtesy of dodmedia.osd.mil. 164k A starboard bow view of the nuclear-powered attack submarine Key West (SSN-722) underway on 2 July 1987. USN photo # DN-ST-89-01398, by Chrix Oxley from the Department of Defense Still Media Collection, courtesy of dodmedia.osd.mil. & submitted by Bill Gonyo. 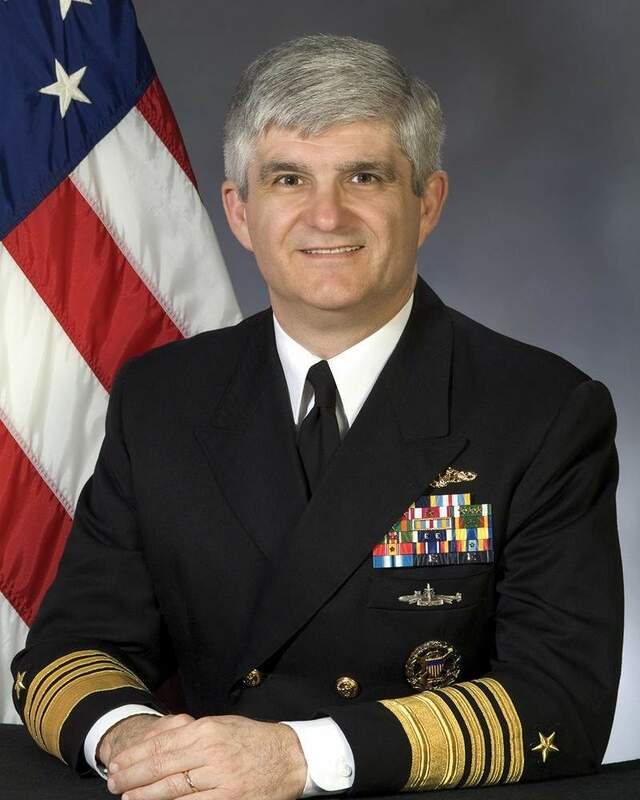 72k Admiral Kirkland H. Donald was the Commanding Officer, Key West (SSN-722), from October 1990 to February 1993. USN photo submitted by Bill Gonyo. 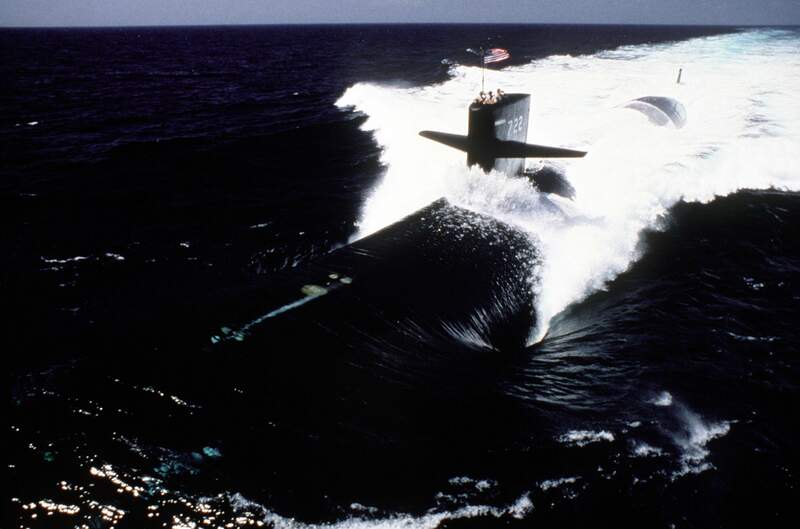 83k Key West (SSN-722) cruises on the surface of the Pacific, 14 April 1997, as part of the Constellation (CV-64) battle group enroute to the Arabian Gulf to enforce no-fly zones and monitor shipping. USN photo N-4126O-002, by PH3 James W. Olive. Submitted by Fabio Peña, courtesy of NAVCHINFO web site. 35k Raised in Chicago, RADM. William Hunter Hilarides graduated from the U.S. Naval Academy in 1981 with a Bachelor of Science in Physics. After graduation, he served as master of the Naval Academy Sailing Squadron sloop Avenger, competing in numerous offshore racing events. Prior to command, he served at sea aboard Pargo (SSN-650), Gurnard (SSN-662) and Maryland (SSBN-738), deploying to the North Atlantic, Mediterranean, Arctic and Western Pacific, as well as conducting several strategic deterrent patrols. 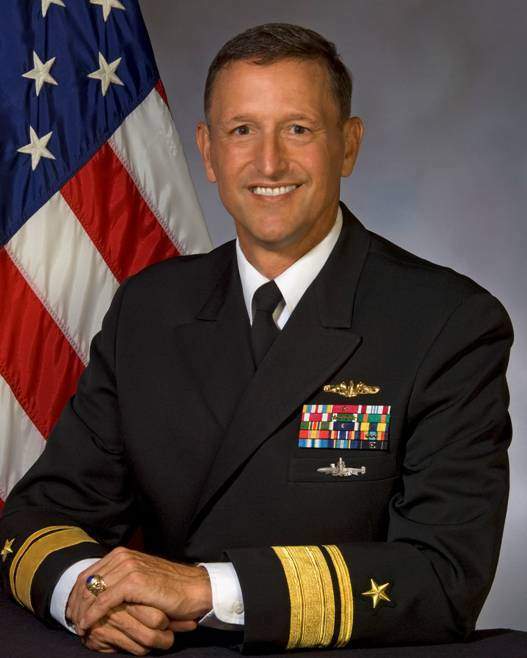 Ashore, he served as flag lieutenant to commander Submarine Force, U.S. Atlantic Fleet; personnel assignment officer at the Bureau of Naval Personnel; action officer on the Joint Staff in the Force Structure, Requirements and Assessment Directorate (J8); and, Requirements and Acquisition branch head on the staff of the chief of Naval Operations, where he served as the Navy representative to the Joint Requirements Panel. 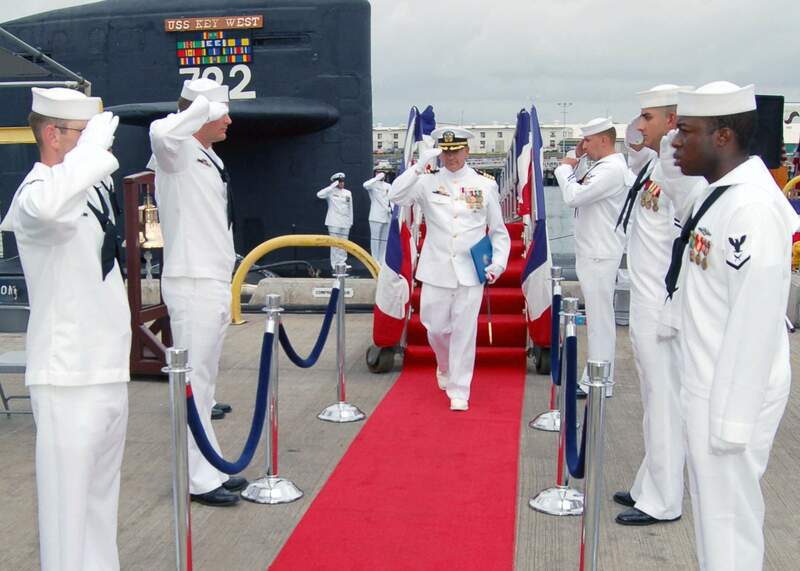 Hilarides commanded the Key West (SSN-722) from May 1998 to November 2000 in Pearl Harbor. In command, he deployed to the Western Pacific and conducted a major shipyard maintenance period. USN photo submitted by Bill Gonyo. 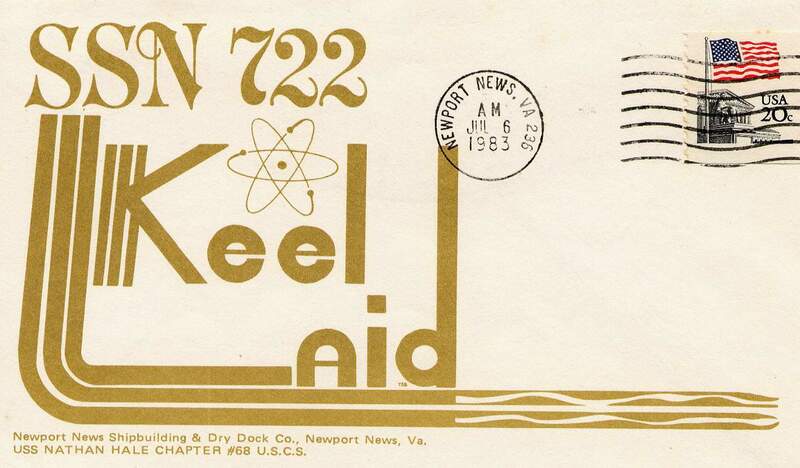 677k 14 page PDF Welcome Aboard the Key West (SSN-722), 2000. PDF courtesy of Scott Koen & ussnewyork.com. 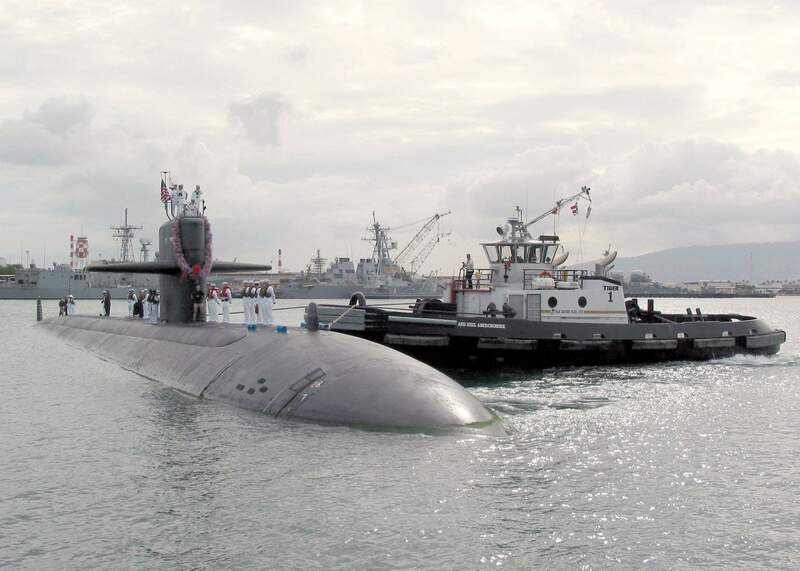 245k Key West (SSN-722), one of four Pacific Fleet submarines to strike at targets in Iraq during the Operation Iraqi Freedom, returns to her home port in Pearl Harbor, Hawaii on 24 July 2003. 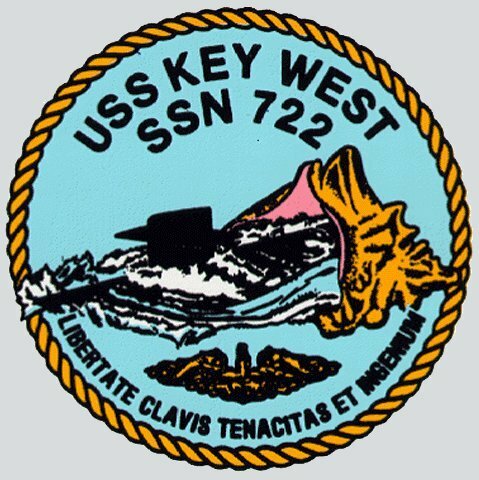 Key West left for deployment on 24 January 2003 and was in the Arabian Gulf when coalition forces began the initial strike against various targets in Iraq. In addition to participating in Operation Enduring Freedom, Key West was the first U.S. warship on station during the initial phase of Operation Enduring Freedom and participated in strike missions into Afghanistan. As a result of the operations, the commanding officer, Cmdr. Chuck Merkel, became the first submarine skipper since World War II to lead his crew in back-to-back combat operations. USN photo # N-8157C-013, by Photographer's Mate 2nd Class Dennis C. Cantrell, courtesy of NAVCHINFO web site. 299k Getting nudged by the tug Neil Abercrombie the Key West (SSN-722) pulls into its homeport in Pearl Harbor, Hawaii, 24 July 2003. USN photo # N-8157C-005, by Chief Journalist David Rush, courtesy of news.navy.mil. 104k Linehandlers aboard the Key West (SSN-722) secure the submarine's mooring lines after arriving in their homeport of Pearl Harbor on 24 July 2003. USN photo # N-5376G-011, by Photographer's Mate Airman Benjamin D. Glass, courtesy of NAVCHINFO web site. 51k Naval Submarine League President Aloha Chapter Capt. Robert Morrison, USN (Retired) presents the Admiral Bernard Clarey Award to Cmdr. Chuck Merkel, Key West (SSN-722) commanding officer. Lt. j.g. 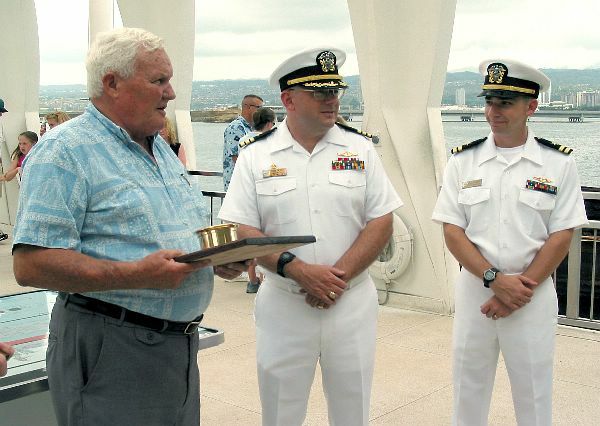 Michael Doniger received the Captain Charles Rush Award at Pearl Harbor, Hawaii on 28 July 2003. Both war-fighting awards were presented at the Arizona Memorial. Key West recently returned from deployment in support of Operation Iraqi Freedom. USN photo # N-0879R-004, by Chief Journalist David Rush, courtesy of news.navy.mil. 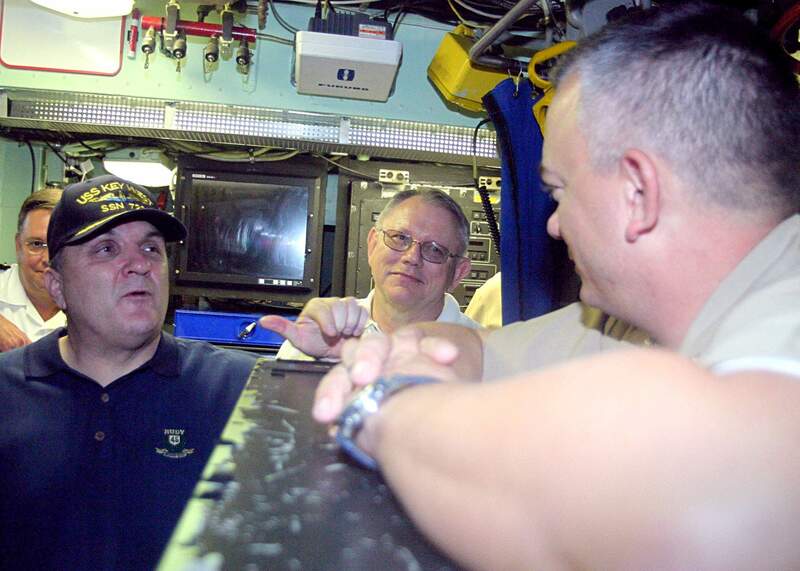 357k Daniel Rudy Ruettiger (Left) chats with Key West's (SSN-722) commanding officer Cmdr. Kenneth Sault during a tour on the nuclear-powered attack submarine on February 25. 2005. Ruettiger travels the country attending different events as a motivational speaker. 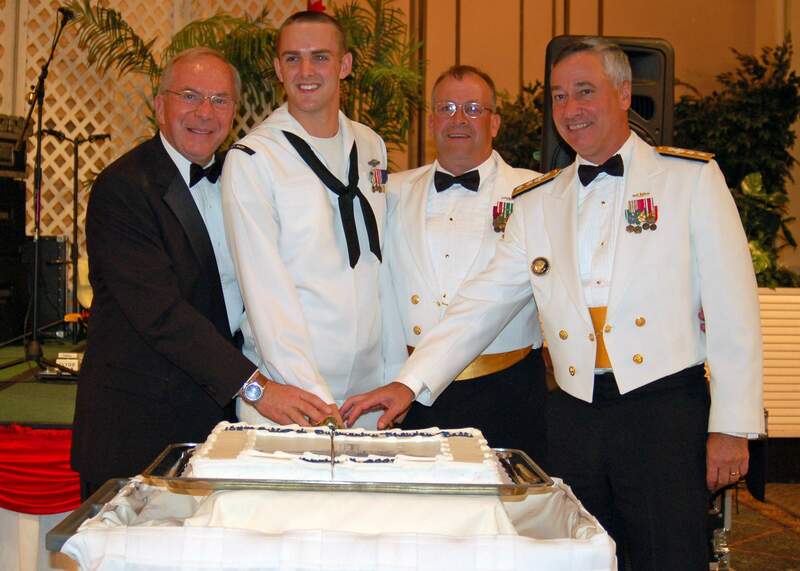 As the guest speaker for the Navy Submarine Ball the following day, he was given the opportunity to tour a submarine. He said it was "an offer, he couldn't refuse." Key West's commanding officer, Cmdr. Kenneth Sault, greeted Rudy topside before heading down into the control room. The tour was a relaxed one filled with puns and sea stories from Rudy who understood a lot of the Navy jargon since he was in the Navy. "I was in the Navy in 1969 as a Seaman Yeoman on a destroyer", he said. The group toured various spaces aboard the nuclear-powered attack submarine including the machinery room, torpedo room, berthing and the crew's mess. "When the captain showed me the enlisted berthing then he showed me his quarters. I could not believe he said his quarters was luxurious. I could hardly spread my arms out", said Ruettiger. After spending an hour on the submarine, it was time to go. However, Rudy said the tour made quite an impression. 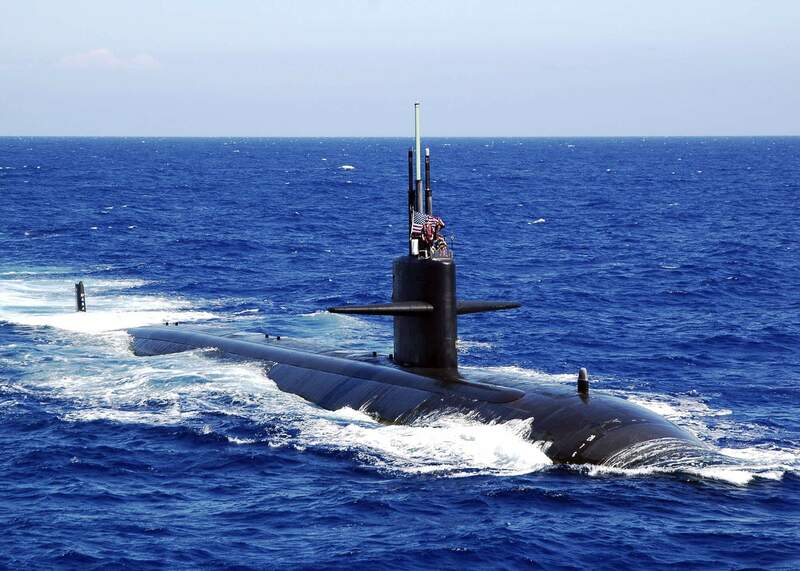 "The submarine force is amazing. People have to see this with their own eyes before they can truly understand what it is about", he said. Like a true motivational speaker, Ruettiger had a few words to say to all U.S. Navy Sailors. "I would like to thank Sailors for their dedication. Stick in there. You don't realize what you are getting out of when you decide to leave the Navy and go to the next level this experience is going to take you a long way," Ruettiger concluded. As fans cheered RU-DY, RU-DY, he sacked the quarterback in the last 27 seconds of the only play in the only game of his college football career in 1974. He is the only player in the school's history to be carried off the field on his teammates' shoulders. USN photo by JO2 Corwin Colbert, courtesy of news.navy.mil. & submitted to this site by Bill Gonyo. 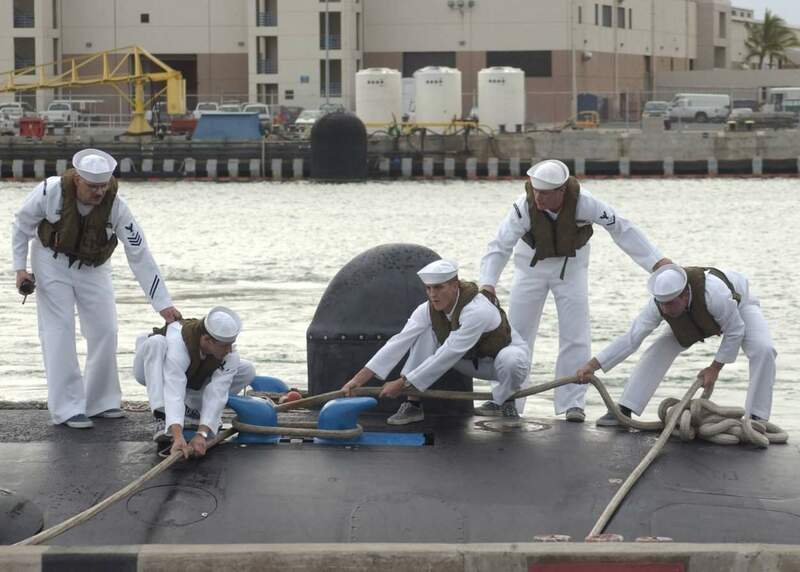 371k Sailors aboard the Los Angeles class fast attack submarine Key West (SSN-722) place the flower lei on the conning tower on their submarine. USN photo # N-4995T-062, by Photographer's Mate 3rd Class Victoria A. Tullock, courtesy of news.navy.mil. 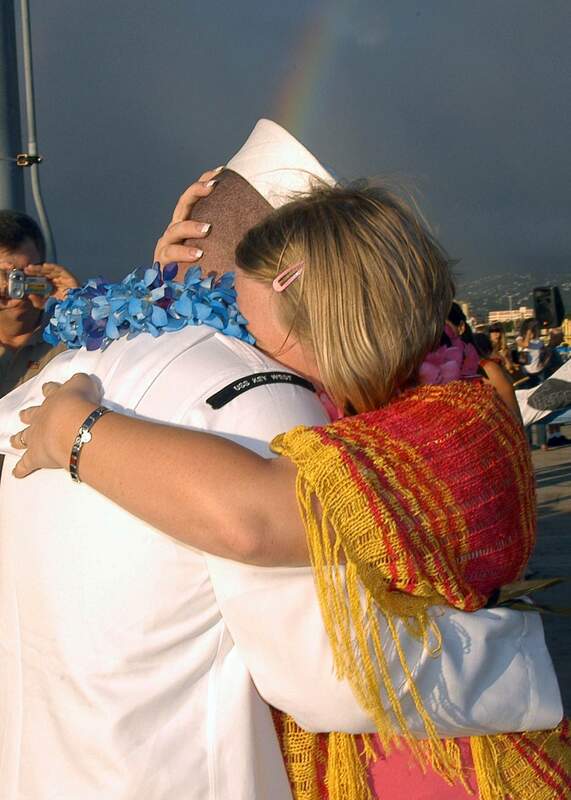 240k Torpedoman's Mate 3rd Class Ernest R. Williams, assigned to the Key West (SSN-722), embraces his wife after returning home to Pearl Harbor, Hawaii after a regularly scheduled deployment. USN photo # N-4995T-186, by Photographer's Mate 3rd Class Victoria A. Tullock, courtesy of news.navy.mil. 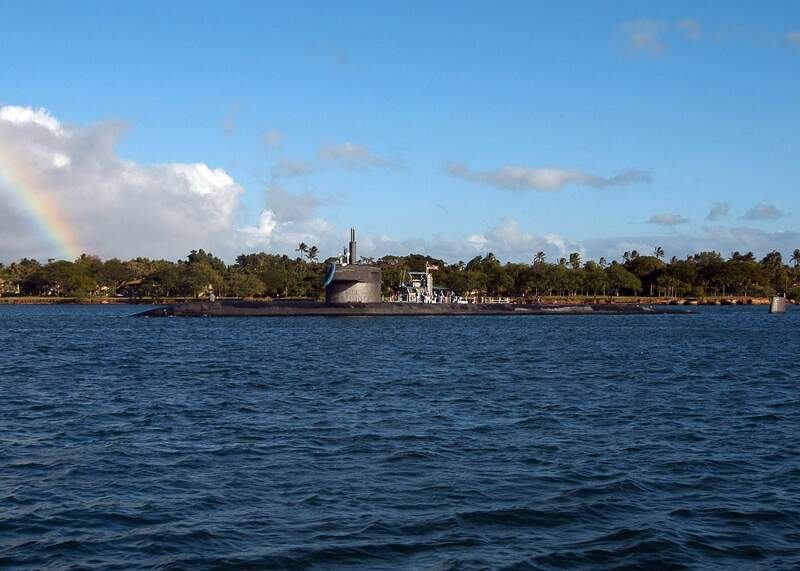 293k The Key West (SSN-722) arrives in Pearl Harbor, Hawaii, after a regularly scheduled deployment, 10 November 2005. USN photo # N-4995T-088, by Photographer's Mate 3rd Class Victoria A. Tullock, courtesy of news.navy.mil. 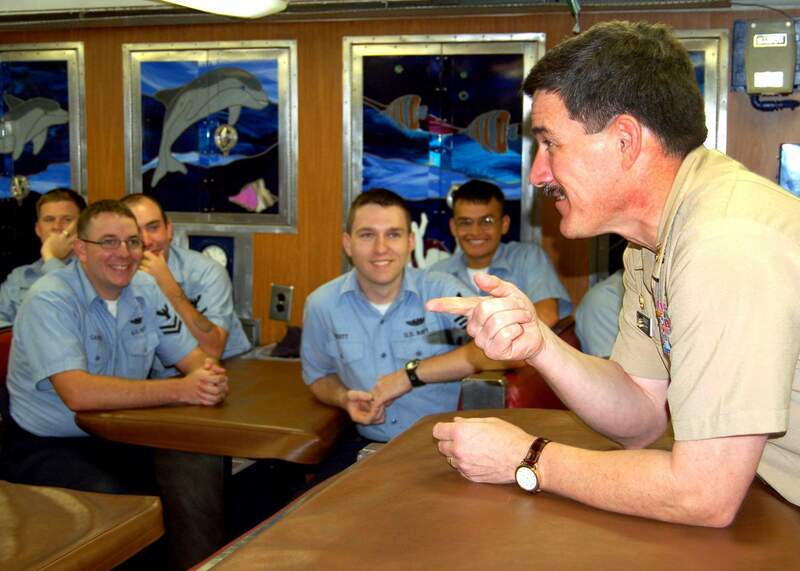 240k Master Chief Petty Officer of the Navy (MCPON) Terry Scott speaks to the crew of the Los Angeles class fast attack submarine Key West (SSN-722) on 6 December 2005. Key West recently returned to her homeport of Naval Station Pearl Harbor from a West Pacific deployment on 10 November 2005. USN photo # N-0879R-006, by Chief Journalist David Rush, courtesy of news.navy.mil. 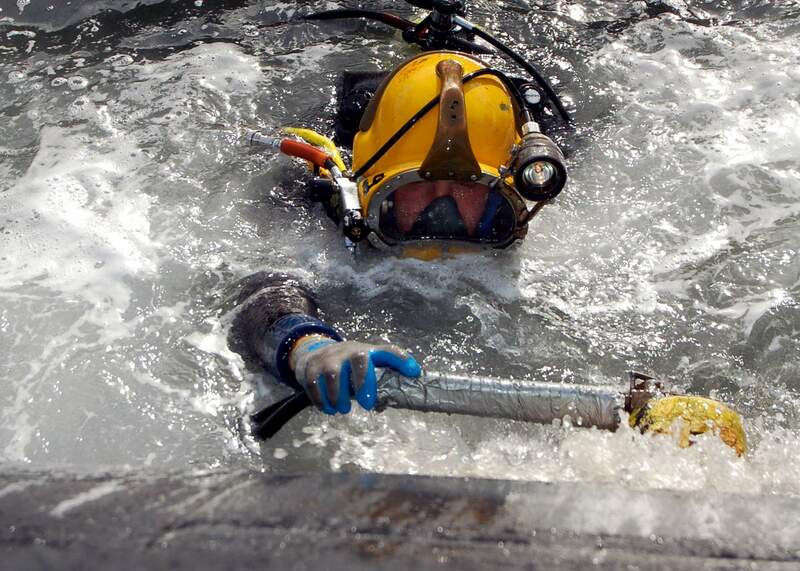 412k A U.S. Navy diver uses a scrubber to clean the hull of the Key West (SSN-722), 6 December 2005. USN photo # N-0879R-005, by Chief Journalist David Rush, courtesy of news.navy.mil. 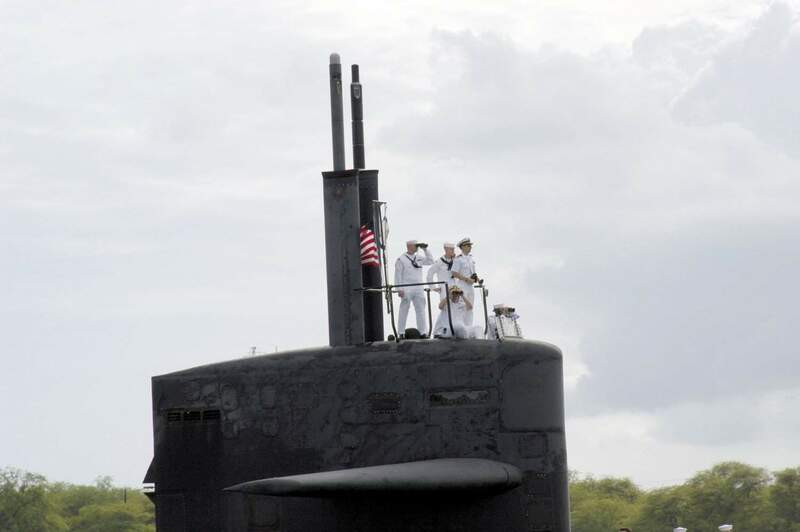 233k Key West (SSN-722) sailors salute as sideboys, after Cmdr. Thomas E. Ishee relieves Capt. Kenneth R. Sault as commanding officer, Pearl Harbor, Hawaii, 14 March 2006. USN photo # N-0879R-001, by Chief Journalist David Rush, courtesy of news.navy.mil. 407k Key West (SSN-722) sails in formation with a group of 28 ships and submarines at the conclusion of Exercise Rim of the Pacific (RIMPAC) 25 July 2006. 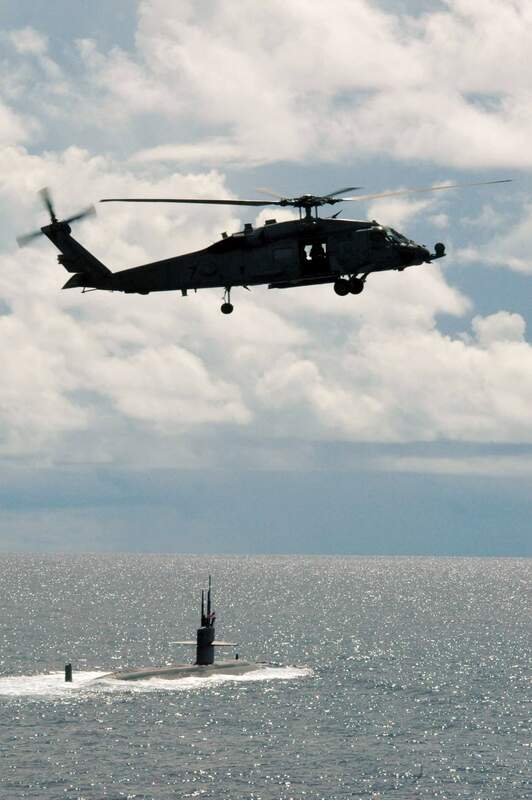 Eight nations are participating in RIMPAC, the world's largest biennial maritime exercise. Conducted in the waters off Hawaii, RIMPAC brings together military forces from Australia, Canada, Chile, Peru, Japan, the Republic of Korea, the United Kingdom and the United States. USN photo # N-6074Y-0111, by Mass Communication Specialist 1st Class M. Jeremie Yoder,courtesy of news.navy.mil. 192k An HH-60H Seahawk from Helicopter Anti-Submarine Squadron (HS) 14 assigned to Kitty Hawk (CV-63) flies over Key West (SSN-722) prior to Valiant Shield's photo exercise. USN photo # N-3136P-041 by Mass Communication Specialist 3rd Class Jimmy C. Pan, courtesy of news.navy.mil. 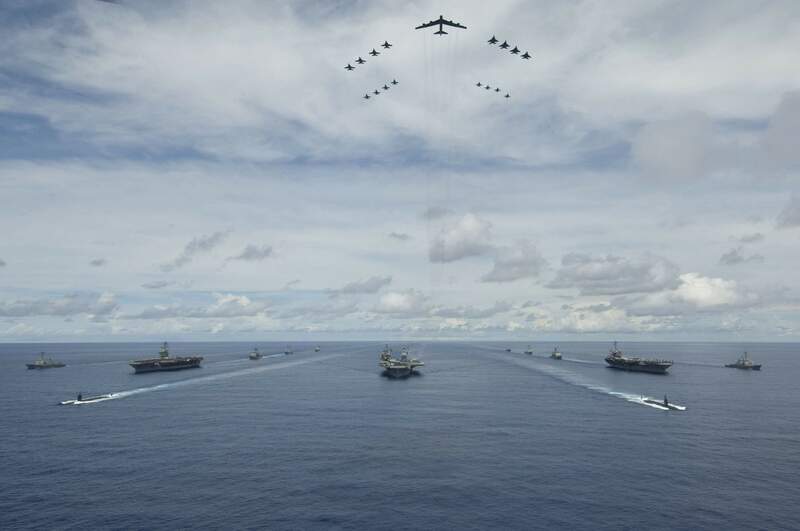 288k A U.S. Air Force B-52 Stratofortress aircraft and 16 other aircraft from the Air Force and Navy fly over Kitty Hawk (CV-63), Nimitz (CVN-68) and John C. Stennis (CVN-74) Strike Groups during Valiant Shield's photo exercise while at sea 14 August 2007. 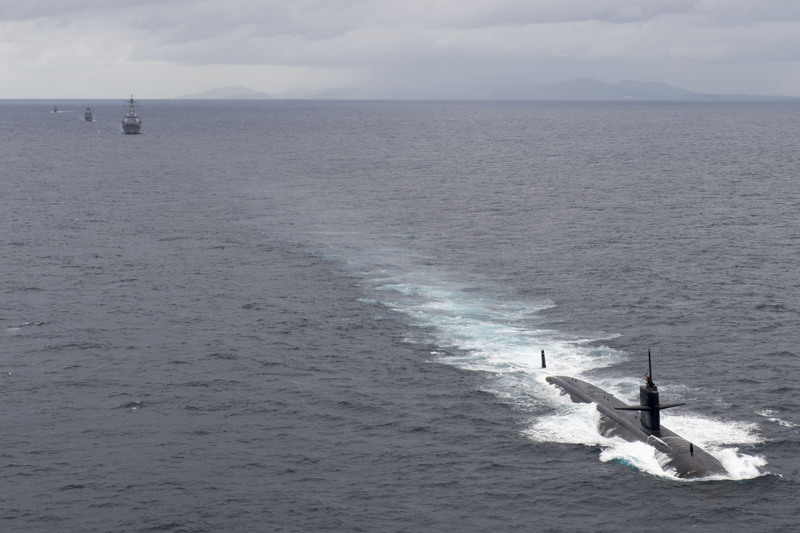 The joint exercise consists of 28 naval vessels including the submarines Key West (SSN-722) & Hampton (SSN-767) & more than 300 aircraft, and approximately 20,000 service members from the Navy, Army, Air Force, Marine Corps and Coast Guard. DoD photo # 1542987 by Mass Communication Specialist 2nd Class Jarod Hodge, courtesy of jccc.afis.osd.mil. 261k Commander, Submarine Force U.S. Pacific Fleet Rear Admiral Joe Walsh and Retired Vice Admiral Al Konetzni join in as the longest submarine qualified Sailor in attendance, Submarine Force U.S. Pacific Fleet Force Master Chief (SS) Morris Pollard and the most recent submarine qualified Sailor in attendance, Machinist Mate 2nd Class (SS) Kevin Pallagi from the Key West (SSN-722) cut the birthday cake at the 108th Enlisted Submarine Ball, Friday, 19 April 2008, held in the Coral Ballroom at the Hilton Hawaiian Village. 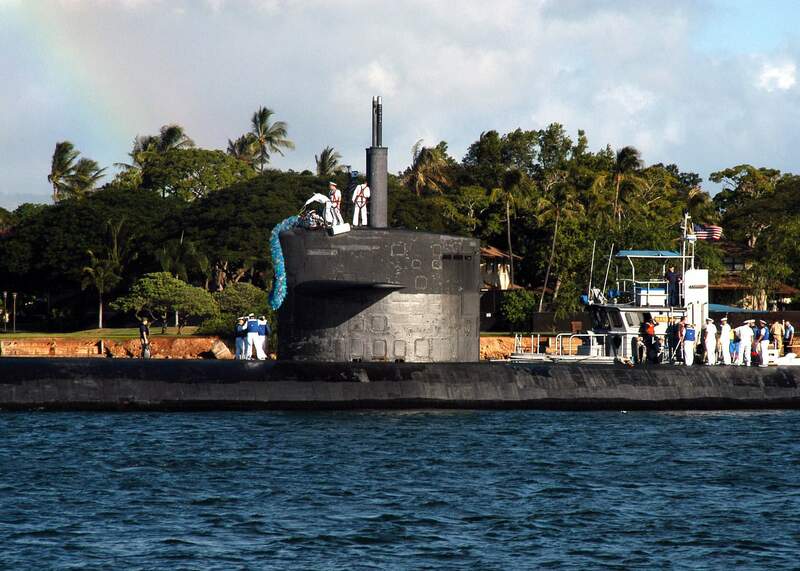 More than 1,000 Submariners and their guests from all over the Hawaii area joined together to celebrate the 108th birthday of the Submarine Force. USN photo # N-9486C-003 by Mass Communications Specialist First Class (SW) Cynthia Clark, courtesy of news.navy.mil. & submitted by Bill Gonyo. 393k The Los Angeles class fast attack submarine Key West (SSN-722), the Arleigh Burke-class guided-missile destroyer Sterett (DDG-104), and the Royal Thai Navy frigate HTMS Naresuan (FFG-421) and the corvette HTMS Long Lom (FS-533) conduct a transit exercise as part of Exercise Guardian Sea 2017 on 26 May 2017. USN photo 170526-N-ZW825-091 by Mass Communication Specialist 1st Class Byron C. Linder courtesy of news.navy.mil. 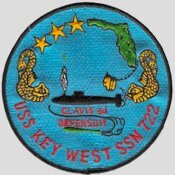 There is no DANFS History currently available for Key West (SSN-722) at the Haze Gray & Underway Web Site, the main archive for the DANFS Online Project.